At the McDonald Farm Adams’ Confederate brigade encounters the 42nd and 88th Indiana along with half of Bridge’s Battery. The three guns retreat to link up with the rest of the battery. Stovall’s Brigade runs into the 104th Illinois in the fields to the south. Helm’s Brigade runs into trouble almost immediately. The advance begins in a generally northwest direction, but the brigade splits when it encounters the Union line. The left half of the brigade wheels due west and confronts the Union line directly. 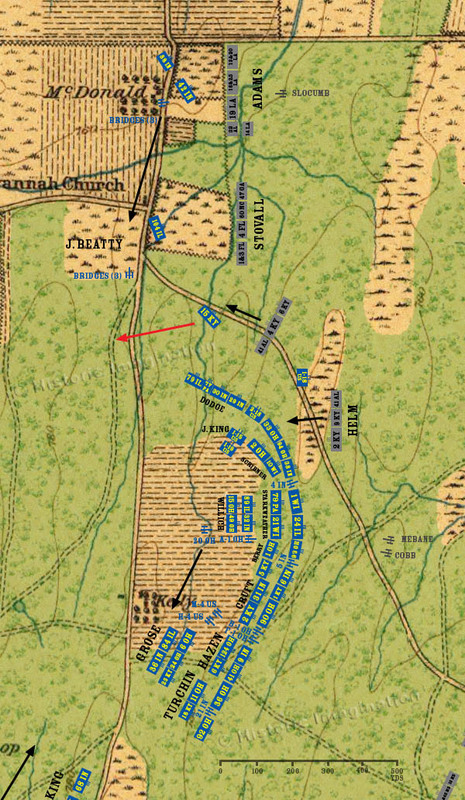 The right half continues to the northwest, taking flanking fire from the advanced 1st Battalion, 18th U.S. Moving on, the right half of Helm’s Brigade takes the 15th Kentucky by surprise in the woods, routing the lone regiment. Mebane and Cobb's batteries unlimber east of a small knoll opposite the Union lines and hand push the cannons to the top.